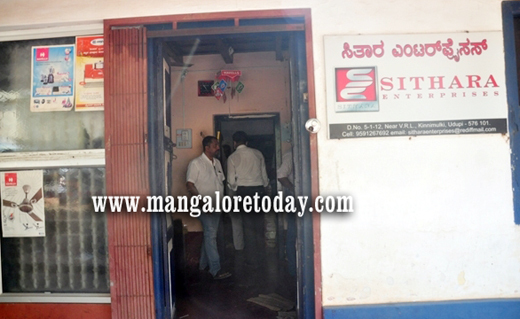 Udupi, March 23, 2015: Electronic goods worth nearly Rs 8 lakh were stolen in a major burglary reported from a wholesale electronic goods store at Kinnimulki. The stolen goods include 700 electric irons, a lap top, mobile phone, three computer monitors and a gas stove. The theft at the Sithara Enterprises owned by Prabhaker Kalmady came to light only on March 23, Monday morning when the shopkeeper had arrived as usual to open the shop. The shop had remained closed since March 21, Saturday night. It has been gathered that the thieves had used an axo blade to open the shutters of the main door. Police officials have visited the spot and investigations are in progress. Meanwhile, a watchman at a nearby apartment complex informed that he had heard some sound during night but could not find anything on inspection.